Liberty University celebrated the grand opening of its new Jerry Falwell Library on Jan. 15 before more than 400 invited guests — including local and regional leaders, local college administrators, members of Liberty’s Board of Trustees, supporters, and members of the media. The Wednesday morning event was broadcast live to more than 10,000 residential students in the Vines Center for Convocation and to countless other online students and supporters via an Internet stream. Following the service, the facility was officially opened with a ribbon-cutting by President Jerry Falwell, Jr., Provost and Senior Vice President for Academic Affairs Ronald Godwin, Lynchburg (Va.) Mayor Michael Gillette, Library Dean Marcy Pride, and Liberty Co-founder Dr. Elmer Towns. The $50 million, 170,000-square-foot library is the university’s largest investment in any one campus structure to date. It is the first major campus facility to bear the name of Liberty’s founder, Dr. Jerry Falwell. With cutting-edge, interactive features, the building is designed to embody his vision of a world-class Christian university that trains Champions for Christ in all disciplines. 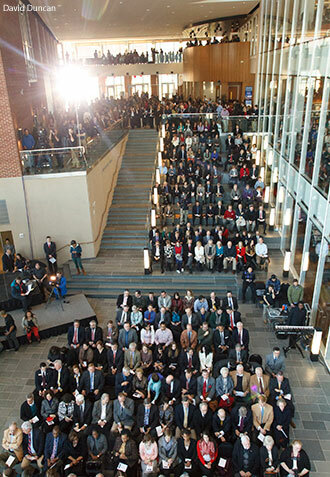 More than 400 invited guests celebrated the grand opening of the new Liberty University Jerry Falwell Library. As a testament to the library’s innovative connectivity, the attendees in both campus locations joined together in worship — those in the Vines Center led by Liberty’s Campus Band and those in the library by LU Praise — while being simultaneously broadcast to online viewers. President Falwell thanked a number of individuals who co-labored with his father to make Liberty what it is today. He also recognized those who contributed to the planning, design, construction, and innovation of the library as well as the groups and civic leaders who support the university. Falwell said Carl Merat, acquisitions librarian and former library dean, was instrumental in the planning and vision of the library. Falwell shared his appreciation for those who contributed to the library campaign through naming opportunities and brick donations. As President Falwell spoke, he recalled his father’s vision and celebrated his faith and endurance in seeing it to fruition. Gillette spoke on behalf of the city, expressing its support for the university and thanking Liberty for its many contributions to the community. Gillette challenged the students to take advantage of the tremendous opportunities afforded them in the new learning space. Towns and Pride each gave a prayer of dedication for the library, asking the Lord to fill it with His presence and continue to bless and empower Liberty’s students to excel in all disciplines and ultimately have a positive influence on the world. He recalled how Dr. Falwell would often stop and count the amazing victories the Lord provided for the university and challenged the Liberty family to carry on that spirit of joy and gratitude. Pride, who has nearly 20 years of professional experience in library work, said she and her staff are looking forward to playing an important role in the academic experience for Liberty’s students. Pride noted that library staff visited some of the most innovative libraries in the country to gain inspiration and ensure Liberty’s library was second-to-none. 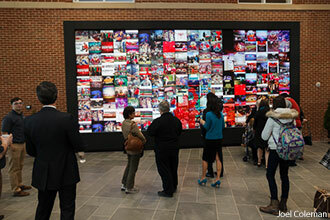 Guests enjoy a 24-by-11-foot media wall equipped with Microsoft Kinect movement recognition technology during the grand opening of the Jerry Falwell Library. 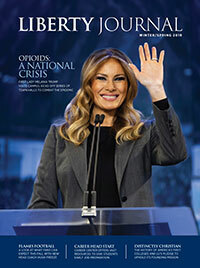 Highlights of the Jerry Falwell Library include a 24-by-11-foot media wall equipped with Microsoft Kinect movement recognition technology, Perceptive Pixel tables (oversized tablets), a technology commons with most of the 160 computers located throughout the building, and interactive information kiosks. Electronic panels outside rooms allow students to reserve group study rooms. The library also features an Automated Storage and Retrieval System, a robotic book delivery system with the capacity for 420,000 items. Architectural elements include a four-story book tower, rooftop terrace, lakeside balconies, a floating staircase, and nearly 40 group study rooms with fully writable walls. Designed with more than 80,000 square feet of interior and exterior glass, the library features plenty of natural light and breathtaking views. A two-story food court — the Tinney Café — features Pizza Hut Express, Starbucks, Tsunami Sushi, and Brioche Dorée (French bistro cuisine). For more information visit www.Liberty.edu/Library or follow LibertyULibrary on Twitter and Facebook.